Training design is the tool middle-distance coaches use to implement accepted and contemporary training theory. Basically, it is a scheme for designing and scheduling various blocks of time in an attempt to accomplish appropriate developmental activities during specific portions of the athlete’s training plan. These blocks of time vary from one year, which is the annual plan, to one season (macrocycle), to one small part of a single practice, which is labeled a unit. As soon as the track season it over it is time to plan for the next one. A single season is called a macrocycle. When a middle-distance coach reaches for a template and begins setting up a sequential training and competition plan it is called plotting the macrocycle. There are various templates that can be used. 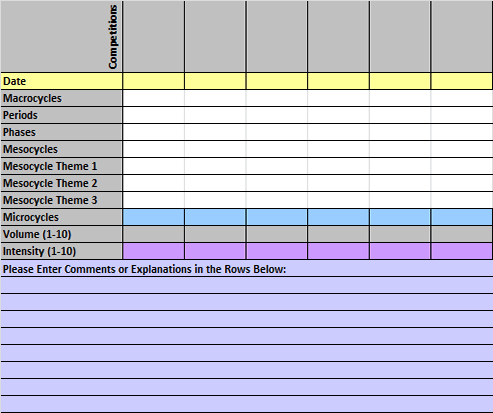 Figure 1 indicates a very popular macrocycle template which contains about all of what a coach will need to accomplish the broad-scale planning stages of a season. First, name the macrocyle: cross country, indoor track or outdoor track. The next objective in plotting the macrocycle will be to enter the start dates of each of the microcycles. But before that can be done a middle-distance coach needs to determine the number of days in each microcycle. One could follow the traditional seven day week, bump it up to nine days to follow a more advanced distance plan, or move to a twelve day microcycle which is very specific to advanced middle-distance training. The point is, determine the number of days the coach will want in the microcycle before training sessions begin to repeat themselves (other than recovery runs). Once the dates are entered on the macrocycle template, then there is an actual calendar for that season. The important competitions can then be added to correspond with the dates. The next step is to determine the length of each of the two periods: preparation and competition. Usually, the preparation period contains more microcycles then the competition period does. Then divide each of the two periods into two phases each. In the preparation period there is the general preparation phase and the specific preparation phase. For example, non-specific winter running for a middle-distance runner is usually characterized as general preparation work. The competition period has two phases; the specific competition phase and the competition phase, and this is when most of the championship competitions are held. Mesocycles are groups of microcycles within a macrocycle and with the same general theme. Themes such as strength, stamina, speed endurance, and peaking are examples of these themes. There are usually multiple themes for each mesocycle. When a theme changes for an athlete, then the mesocycle changes as well. Mesocycles should progress from general to specific as the season progresses. Finally a good macrocycle should have two effort rating scales that the athletes understand. One is for volume and one is for intensity. Scale the microcycles from 1-10 with each effort so the middle distance athlete themselves know hat is being emphasized and to what extent. The macrocycle should begin with an emphasis on volume and not much emphasis on intensity. By the end of the macrocycle the reverse will be true with the cross=over mark right at the date the athlete moved from the specific preparation phase to the pre-competition phase. The macrocycle template should also have a section for notes at the bottom of the chart to keep both the athlete and coach on the same page regarding the specific tools of training design. Follow the middle-distance macrocycle plan as the season progresses, but do not be rigid. If adjustments need to be made, then make them on the fly, but only after a careful analysis of the changes.